Shanghai… an occasion of great joy and enlightenment. | Realise the World! Through our spiritual lives Our Mother has been calling us, to a higher life and a new reality of being with each other and our fellow human beings. That calling, is in part, is to go out into the world and spread Her message. Many who have felt that call have experienced a state of being which is more real, more vital, more vibrant and fulfilling than our normal life experienced as a Yogi taking care of day to day concerns. So in answer to that call of Our Mother, a group of thirty four Yogis have taken to the pilgrims path as part of the Tour of China. 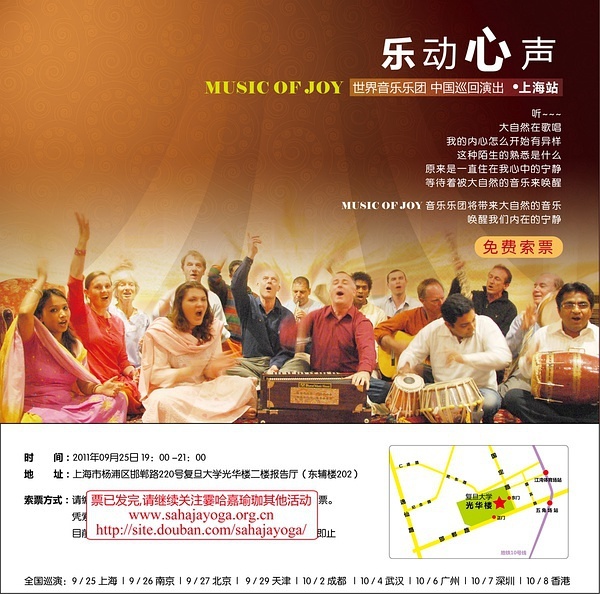 Last night, the first public program was hosted at Shanghai and it was an occasion of great joy and enlightenment. Very much it seemed, as if no time had passed since the last China Tour of 2010 and the program had just taken up where we had previously left off. The venue could accommodate 500 but the hall was full to overflowing, the seats were all full, in front of the stage, passageways, everywhere there were people with beaming smiles and open faces. who seem so untouched and unaffected with the desires of materialism and whole persona is so infused with a natural spontaneity and a joyous innocence. Well we questioned who is really deriving all the benefit of the Tour, it seems as Westerners we are learning much about the vibrant inner qualities of the spirit lived in ones life. The concert was a stunning success the Music of Joy musicians had prepared with much dedication for this tour and it is difficult to say what was the cause of such an amazing spiritual event. The blessings of Our Mother for the people of China was all pervading and ever present, united with the dedication and hard work of the local Yogis, the music, the elevated purpose for which all the Yogis had come from all over the world, all united and combined to create a Sahaj program communicating the reality of Shri Mataji. Everyone was in that moment and reality of spiritual enlightenment, the young and old alike. China still has that beautiful culture where all generations mix happily and freely together. Behind me was an elderly man in his eighties, his face full of light and enjoying the dancing like a young boy. To be a part of times such as these, one begins to feel as if we are beginning to live out the true meaning of our Sahaj spiritual life and answered the calling of Our Mother to all good people to join hands in the greater Glory of Her name and helping to fulfill Her Will. Absolutely wonderful, guys. Tears of joy for you (us) all! .. And this is only the beginning of your tour.. woohoo.